Children and youths are unavoidable. We all grew up alongside tiny tots and went to school together as young children. We faced pubescent predicaments together. And then, we became alienated from our own childhood. Those of us who took the trouble of falling in love and marrying—or marrying and falling in love—and having our own little ones, childhood became a more acute experience when our pleasures of yore became present responsibilities. Raising children is a pleasure. Or it may rather be an adventure—an experience fraught with challenges. To some, it may even be burdensome. For others, it could be a nightmare. This difference is subject to people’s resources, attitudes, outlook and emotional disposition. The societal set-up matters too. For different professionals dealing with children, boys and girls are a class of humans with special traits and needs. As society changes, childhood too is changing. With rapid urbanisation, children are more urban than ever before, losing touch with nature. As in developed countries, children in our cities lead secluded lives. They visit the playground less often and opt for gadgets over friendship. Children’s motivational factors are changing too. Their priorities are shifting. Some have stopped seeing reasons to study. Traditional values mean little to the budding generation. In his book Athot: Ujjwal Bhabisyako, writer and journalist Shreesha Bhandari deals with a number of these issues concerning young people. In this collection of motivational essays, Bhandari discusses the different phases of his own upbringing, reminiscing about his childhood in a pastoral setting where young boys and girls reared cattle, Bhandari discusses team play, little acts of disagreements among his peers, and their innovative ways of keep themselves engaged. He also observes how selfishness crept into their innocent lives as they grew up. As children grow up, they not only acquire knowledge, skills and conscience but also hatred, enmity and selfishness. He notes that as we grow older and wiser, we lose simplicity and naturalness. Bhandari stresses how we remember our past deeds and plan our future actions but do not care what we did not do and what we will not do. We sometimes indulge in trivial and even damaging acts; we meet people who we should not and fail to see those who we must. We say things we do not mean and think things we ought not to. We often don’t much thought to things that actually deserve our attention. We grow in the midst of theses contradictions. Athot has an interesting presentation--full of anecdotes and character sketches of important personalities. Happiness, priorities, punctuality, the perils of junk food, self-dependence, avoiding anger, learning styles, exams, interest in study, indulgences and alternative education are some of the topics discussed in the book. On improving one’s memory, for instance, Athot presents some tips, such as keeping the mind fresh, paying attention, trying something new, encouragement and appreciation, stress management and a healthy lifestyle. Bhandari stresses that a healthy mind exists only in a healthy body. Exercising reduces the hormones that cause stress. As a sleep of six to eight hours is required for healthy living, the author suggests that people not use electronic devices for an hour before going to sleep. Going against popular eating habits, the book rightly stresses that students need to eat fruits, green vegetables and fibrous food that is freshly cooked at home. The book warns that junk food and fast food both affect the body and mind. Athot further provides practical clues on how to tame anger. To make children better members of a family, it gives them ways on how to reorganise things once we’ve used them. It also inspires young people to be self-dependant by presenting before them ways to achieve this trait. 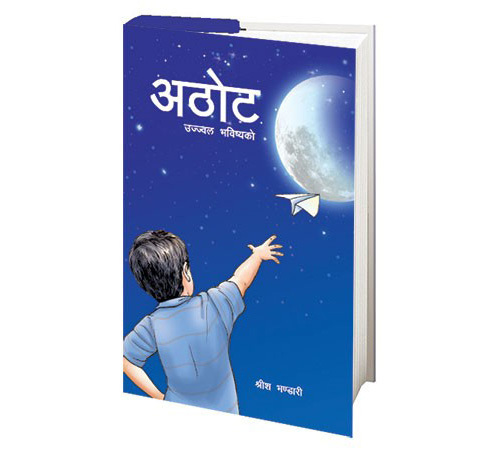 The book gives the new generation resolve to break their bad habits and develop good ones. The book is written in simple yet interesting language. It is an engaging read for students, young people and individuals who take care of others growing up. Though not too long, it took me a long time to read it, as its sentences are loaded with meaning and provoke thought. As I turned the pages, the book took me on a tour of my own childhood, reminding me of my flaws and strengths. At times, it took me as far back as a decade ago, when I was teaching schoolchildren. It gave me answers to a lot of questions and problems that I faced while dealing with young learners. This book deserves to be read by youngsters, who are face much confusion in life. It will not only motivate them, but also enable them to assess their own lifestyle and make some corrections if they have veered off course. For those who lead independent lives, the book offers self-help. It is a valuable addition to any young person’s library.